We’d love your help. Let us know what’s wrong with this preview of There Was an Old Gator Who Swallowed a Moth by B.J. Lee. When the old gator swallowed a moth, it made him cough. But then he followed up with a crab, ray, pelican, shark, and more. The popular children's rhyme is given the Florida treatment in this book for young readers. To ask other readers questions about There Was an Old Gator Who Swallowed a Moth, please sign up. There is a reason why the old poem “There was an old lady who swallowed a fly” is evergreen. It has a fun rhythm and is a hoot to read aloud or read together with a child. Talented poet B.j. Lee gives us a rousing rendition of, and new life to, this poem with Floridian critters. The humorous illustrations by David Opie pair perfectly with the delicious romp of a story. What a unique and humorous take-off on the well-known progressive tale, There was an Old Lady Who Swallowed a Fly! I loved it...and so will every kid who reads it or listens to it. Some of the animals mentioned aren't the run of the mill ones we often encounter in stories...which is fabulous because kids will learn a bit about them. And the rhythm is so much fun and the verbs really help us 'see' the great action that is going on: he swallowed a crab that skittered and scuttled and gave him a ja What a unique and humorous take-off on the well-known progressive tale, There was an Old Lady Who Swallowed a Fly! I loved it...and so will every kid who reads it or listens to it. Some of the animals mentioned aren't the run of the mill ones we often encounter in stories...which is fabulous because kids will learn a bit about them. And the rhythm is so much fun and the verbs really help us 'see' the great action that is going on: he swallowed a crab that skittered and scuttled and gave him a jab. This is a fun, delightful book that children and adults will love. The illustrations are exquisite, the pacing perfect, and the repetition lends itself to a read-aloud riot! This book offers a modern-day take to a beloved classic. B.J. Lee takes the classic "There Was an Old Lady Who Swallowed a Fly" and gives it a fun twist. Set in Florida, the old gator swallows a moth and continues to swallow increasingly larger animals in a misguided attempt to fix his situation. Children will enjoy reading or listening along to the poetic text. David Opie's illustrations add even more humor. This book is a must have for any classroom or library. Author B.J. Lee brings fresh spin to a classic children’s favorite: There Was an Old Lady Who Swallowed a Fly. This swampy poem is filled with page-turning fun as the action builds from one spread to the next. The playful rhythm and humorous illustrations make this the perfect read aloud for both classrooms and bedtime alike. Can this book be any funnier? Kids will love the quick pace and mounting action - and the rhymes are very well done! This is the kind of book kids will want to read over and over again...I'm just glad it has a happy ending! A modern witty interpretation of the old rhyme, this book is a delight! The story flows beautifully and the anticipation builds up. Who’s going to be swallowed next- that is the question! The illustrations are traditional and lively and would surely appeal to kids! There was an old story that’s written anew. I loved reading it aloud and so will you! In this clever take on the Old Lady Who Swallowed a Fly, Old Gator who lives in a lagoon in Florida swallows lots of local fauna. The language is wonderful. The story and illustrations are great fun. And while readers are giggling about all the things the silly old Gator has managed to ingest, they will also be getting an introduction to the animals of Florida. My children and I enjoyed this rendition of “There was an old lady who swallowed a fly.” My children appreciated the expressive illustrations, and the deluge of the alligator’s contents! As a teacher, I can see this book being a useful addition to classroom libraries for all the learning opportunities that arose during and after reading. Laugh out loud funny! Whether or not you and your little one are familiar with the original folk song, you will delight in this classic repetitive story. Gator's exploits from a tiny moth to...well, I don't want to give it away...are hysterical. And David Opie's animated illustrations of the series of swallows are bound to keep any young (and older!) reader captivated. Highly recommend this re-invented classic. 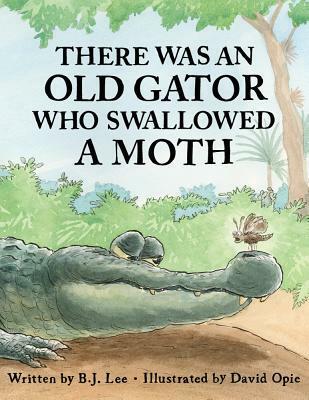 THERE WAS AN OLD GATOR WHO SWALLOWED A MOTH is a great read! It’s such a fun read-aloud experience, and would be great in the classroom. If your little one enjoys rhyme and repetition, they’ll love this. If they love animals, they’ll love this. The illustrations are great fun, and beautifully done. My kids loved this new twist on "There was an old lady who swallowed a fly". B.J Lee's book is perfect for reading aloud and the lively illustrations will entertain a crowd while learning about Florida's wildlife. A fun and fresh take on a well loved rhyme, this book keeps us shifting in our seats when an alligator doesn't stop with a moth. Instead, he swallows up a horde of animals that leave him coughing and coughing, until...find out for yourself! Clever and witty in rhyme and plot, this book is an overall delight! This book was so funny. The kids liked the familiar theme, with a new twist, and I really liked that there was a different ending for a change. The illustrations are hilarious too. My kids are ages 5 and 7 and both liked it, and we would recommend it to others. I love sing-able books! There Was an Old Gator Who Swallowed a Moth is a fabulous new take on an old favourite! BJ Lee uses Floridian creatures to bring a breath of fresh air into this rollicking tale! Wonderful to use with Kindergarten and Pre-K classes at story time or Music. BJ's words are paired with hilarious illustrations by David Opie! This book is such a fun version of the "There Was an Old Lady Who Swallowed a Fly" story! It's a great way to share rhythm and rhyming with kids, but even more importantly, it's a wonderful way to introduce your young readers to the animals of a Florida lagoon. With a funny resolution that--spoiler alert--results in all animals surviving, young readers will want to read this book again and again. Full of Florida animals and clever rhymes, There Was an Old Gator Who Swallowed a Moth is an fun regional take on the well-known cumulative song There Was An Old Woman Who Swallowed a Fly. David Opie’s animals are hilariously expressive. The book provides ample opportunity for classroom tie-ins - check the author’s site for a free teacher guide. I love this new take on an old classic. The rhythm, rhyme, and the Florida animals makes for a fun and educational read! Bouncy, clever rhymes make for a fun, Floridian take on this classic cumulative tale. Kids are sure to enjoy the absurdity and the illustrations add to the humor. As a bonus, this book can also serve as an opportunity to discuss animal habitats. Super fun twist on the classic THERE WAS AN OLD LADY WHO SWALLOWED A FLY. Rollicking rhyming text and whimsical illustrations make this a fun read aloud! A Florida twist on an old classic. Several new animals make an appearance in this version of an old classic AND in Gator’s belly. The manatee is the best. This is such a clever story written by the talented poet, B. J. Lee, taking us on a wonderfully written and illustrated journey of a familiar children's story, yet with all the elements of the Florida habitat. Children, families and educators will have a ball reading this outloud, listening to the poetic rhyme and eyeing enthusiastically David Opie's humorous, sweet, and colorful illustrations. This is a definite must have picture book for ages 0-101! Fun new twist on There Was an Old Lady Who Swallowed a Fly. Florida swampland animals replace the farm critters of the original rhyme. Loved the illustrations, especially the gator. The author had me along on the ride for this take off of the old rhyme (and Burl Ives song), There Sas an Old Lady Who Swallowed a Fly right up until the ending which I felt fell a little flat. Kids will appreciate the cumulative form of the story and the terrific illustrations. A fun new take on "Swallowed a Fly." The rhymes have entertaining actions that match the unique Floridian wild life. I was born and raised in Miami, and it was really fun to share this with my son and point out all of the unique animals that he doesn't see daily. The illustrations are charming and I love the light humor.